Usually people watch documentaries about topics which intrigue them. I stumbled upon this film which was about an inventor I’d never heard of (Tim Jenison) trying to recreate a painting by a 17th Century Dutch artist with whom I was not familiar (Johannes Vermeer). I didn’t even know that it was Directed by Teller and featured Penn until the credits started. I’m not sure why I watched this. But I did. And I am so glad that I did. I watched TIM’S VERMEER (2013) on 10.1.14. It was my first viewing of the film. Johannes Vermeer produced incredible paintings in the Netherlands from the 1650s through the 1670s. His visual style is considered slightly unusual in that the color palate seems to illuminate the entire piece of art, almost as if it were more photograph than painting. 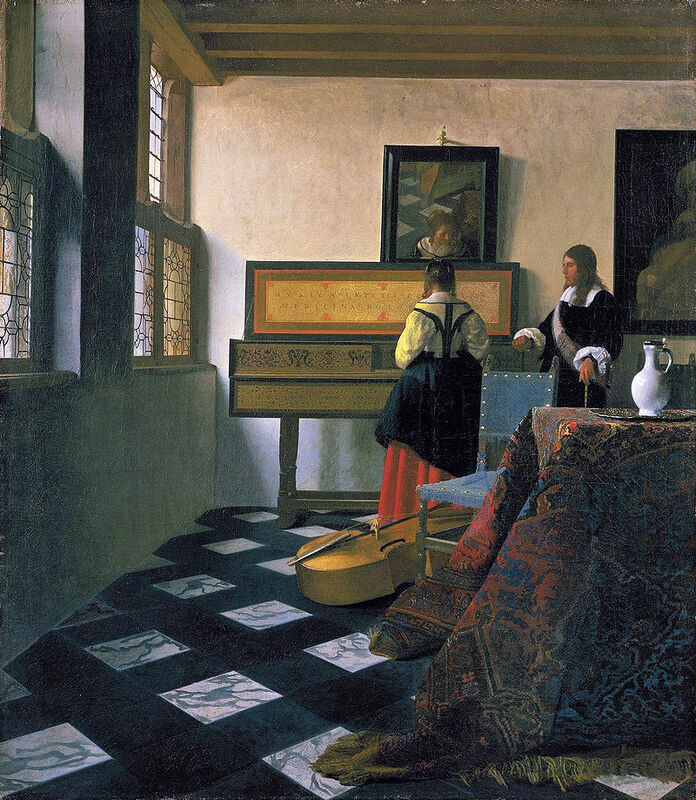 His painting from the early 1660s, The Music Lesson, is the major subject of the documentary TIM’S VERMEER. The Tim of the title is inventor and tech savant, Tim Jenison. The film opens with him saying that he is going to reproduce this exact painting. He posits that this may be difficult because he has never been a painter. He is, however, an inventor. It is his theory (and that of others before him) that Vermeer used optics to paint his work. Generally, a lens might be used by artists to cast a reflection of their subject, trace that work, and then paint what they see. 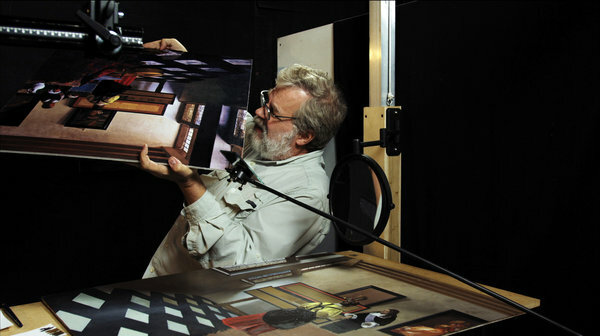 Jenison believes that Vermeer was not just using this technique, but something more to get the exacts of the colors and lights and shadowing that nobody else in that era was able to produce. If this sounds dry, then it should be noted that this is one of the most consistently satisfying documentaries in recent history. Director Teller (of Penn and Teller fame) takes five years of documenting this project and whittles it down to a mere 80 minutes. While many documentaries are present after many of the subjects revelations have been made, TIM’S VERMEER is able to actually document some revelations in real time as they happen. We watch Tim have success, deal with failure and obstacles, and painstakingly attempt to recreate the painting after discovering the means (which he believes) by which Vermeer created his work. A major theme of this film has to do with the ideas of technology versus art. At first, it would seem Vermeer was ‘cheating’ by creating the work the way he did. It is as if using technology is somehow less visionary than creating from a blind eye. The documentary fights that idea, not surprisingly considering the inclusion of an inventor and a couple of magicians, and makes a strong argument. Seeing Tim take years out of his life to create this one piece of work lifts Vermeer from that of just another master painter, and into a category of visionary and inventor. If Tim’s assertions are correct, Vermeer came up with a way of producing art that nobody else considered before or for 350 years after. Some questions may linger afterwards. Seeing, for example, how long it takes Tim to reproduce the work, one might wonder how Vermeer got people to stand still on a bustling street for long enough to paint them the way he supposedly does. Of course, with his considerable skill, it is entirely possible that some additionally flourishes to his work were added free hand. The arguments against the possibility of Vermeer working the way suggested by the film are not nearly as strong as the arguments for it. TIM’S VERMEER is top level documentary work. One need not have any knowledge of anyone involved with this film to be dropped in and swept away by its endearing energy. While the subject matter may not pique interest, the viewer who gives it a chance will be greatly rewarded. With documentaries, the score EFFECT replaces ACTING. EFFECT considers how successful the documentary was in relaying its point of view. ~ by johnlink00 on October 2, 2014.